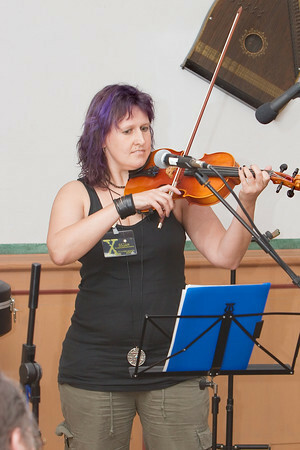 2012 Guest of Honour: Silke Kovàr | D.F.D.F. Presented for your consideration; a garden in the town. Down here you will find no thriving wilderness, only a few straggling weeds clinging to the corners of grey, forbidding buildings, choked by the exhausts of passing cars; but turn your eyes upwards, and see where human strength and thought has created an oasis of perfect beauty. Here bloom flowers which have been planted and cared for with courage and effort. Here are the blessings of nature, where they are most needed; and from this height one can also see both the good and the evil of civilisation in proper perspective. The gardener holds it all in balance, and tends these plants with the same care she bestow on that other garden for which she is responsible; a garden of knowledge and wisdom, of culture and history. There bloom books, whose petals are inscribed with the thoughts of various writers, young and old and long dead, and the customers who enter this garden, also young and old but hopefully not long dead, gaze in wonder at these treasures. All right, that’s enough poetic imagery. We’re talking about Silke Kovàr here, a superbly talented filker and a good friend. She plays guitar and violin, writes haunting songs that linger in the memory, and translated my Mina’s Song so skilfully that I found meanings in it I hadn’t understood before. She was lead singer and songwriter for the Milchstraßenstreuner, who made two brilliant albums, “Umwege” and “Briefe aus der Unendlichkeit.” She’s now the newest (and most distant) member of Cosmic Trifle, and we’re all looking forward to playing and singing with her. And she does have a garden. And it is beautiful. Silke has been a “Streuner”, a roamer. She roamed over from the Milkyway into Filk one autumn in 2003 and probably was not too sure at first if she got where she wanted to be. Silke is absolutely unusual and unorthodox but had neither much in common nor much experience with the average fan. Soon she must have come to the conclusion that we are not a bad lot and have the tendency to “assimilate” new folks, especially those who are talented songwriters and violin players! Some nine years later she has already built some treasured moments: concerts with her former band, the “Milchstraßenstreuner” at FilkCONtinental, collaborations with filkers like Sabine Kinder or Steffi Zurek, the other half of “Angry Antz”, travels to the british FilkCon and fantastic translations of british filksongs, Baseball-Discussions with Jeff & Maya Bohnhoff, attendances at general SF-Conventions like DortCon (must have been love, I guess without us she would never have gone there :)) and lots more besides. And now, at this weekend, she is your guest of honour at DFDF. –> to wrap ist up: wonderful concerts and an awesome woman. Have lots of fun with Silke!